Ludwig Becker, Charles Stone and William Purcell all died at a waterhole on the Bulloo River where they had set up a Depot camp. The camp was called Bulla, although the waterhole is now called Koorliatto. This should not be confused with the Koorliatto Waterhole mentioned in Wrights diary and Becklers journal, this waterhole was some distance to the south of the Depot camp. Charles Stone died on Monday 22 April 1861 , William Purcell died the next day, Tuesday 23 April 1861 and Ludwig Becker died on Monday 29 April 1861 . All three were buried together near the waters edge. Initially, three blazed trees marked the spot and these were later protected by a chain fence. In early 1987 a small headstone was erected by the station hands at Bulloo Station and unveiled by Brisbane members of the Queensland Historical Society. The chain fence was replaced with a more sturdy stockrail fence, which protected the headstone but not the three blazed trees, and now only one of the blazed stumps remain. 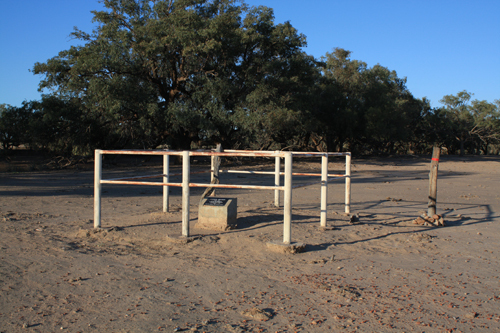 The grave is on Bulloo Downs Station which covers 7,380 square kilometers. 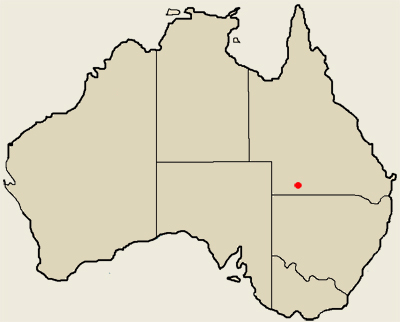 Bulloo Downs was first settled in 1864 and Thargomindah was surveyed in 1874. Kidman bought the property in 1904.